As former Boston residents, Katy and I come down on opposite sides in the whole Mike’s vs Modern debate. So on a recent trip back East, I decided to enlist a cadre of tasters in a cannoli test panel to put this controversy to rest. The results were not at all what I expected. 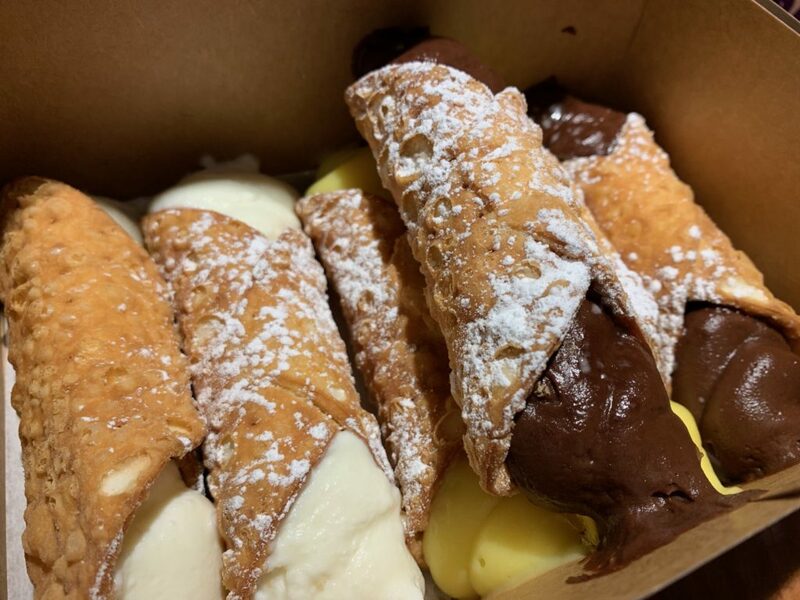 We ventured to the North End on a Friday night and braved the lines to acquire half a dozen cannoli each from Mike’s Pastry and Modern Pastry. Awkwardly, we reconvened at Modern for our taste test. Modern has a more traditional assortment with fewer varieties. I asked for a mixed batch and received two each plain, chocolate, and vanilla. I was given the choice of powered sugar dusting, or not. The cannoli were filled to order and neatly packed in a small box tied with the trademark string. My compatriots at Mike’s were offered a plethora of flavors to choose from, all pre-filled and on display behind glass. Their six selections ran the gamut, including one with chocolate peanut butter filling and one with a florentine shell. Unfortunately due to Mike’s messy packing strategy, it was impossible to get a picture of all six cannoli in their boxed glory. The product from Mike’s cost a bit more but are also substantially larger. Testers enjoyed the chocolate chips, which were not offered at Modern. On the whole, everyone preferred the variety of flavor options at Mike’s over Modern’s more traditional selection. The real test is on taste, and this is where things got a bit more complicated. The panel universally found the Modern Pastry shells crisper and more satisfying. The Mike’s Pastry shells were denser and tasted slightly stale in comparison. But when it came to filling, Mike’s plain and chocolate fillings were universally lauded as lighter and more pleasing, while Modern’s more custardy fillings were felt to be inappropriate in this type of pastry. Some of us enjoyed the creaminess of the Modern filling, but we all agreed that the filling from Mike’s was a better overall fit. 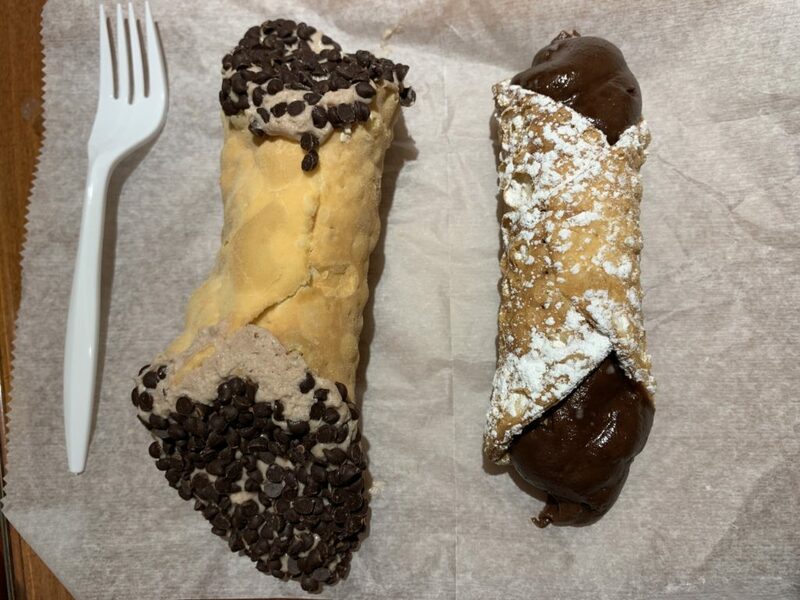 Surprisingly, there was near universal agreement on the overall winning cannoli, and it turned out to be the florentine. This is, of course, non-traditional in the extreme, but it was undeniably delicious, and, at the end of the day, that is what really matters. The choice of cannoli is a deeply personal one, and I wouldn’t claim to have resolved this never-ending debate. 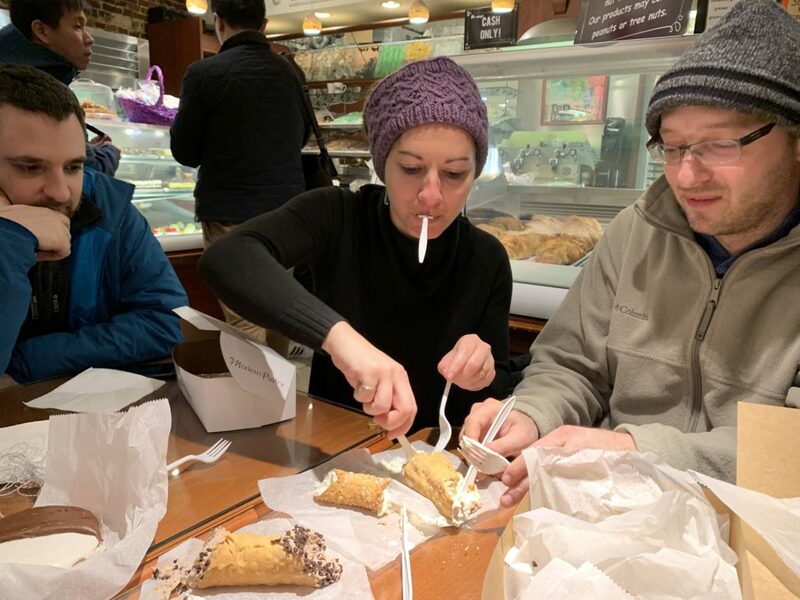 In conclusion, cannoli are delicious and sharing them with others only adds to the experience. An aristocrat of Tsarist Russia finds a place for himself within the confines of house arrest under Bolshevik rule as Moscow changes outside his window. This novel is a charming bit of storytelling, a nice palette cleanser after my recent diet of distressing news and heavier fiction. It discusses atrocities and suffering only glancingly. Count Rostoff is preternaturally upbeat, charming, and resourceful. The antics are delightful, the friendships and interactions uplifting. But it is hard to shake the feeling that the American author is appropriating a foreign culture’s pain and suffering for our amusement, and in the end the novel does not sit well with me. Is a carbon-restricted future really impossible? The “Green New Deal” is a blanket term for an amorphous set of ideas about restructuring American society to address the coming climate crisis. If it does nothing else concrete, the Green New Deal has ignited long-overdue discussion about the destructive effects of climate change and practical solutions for mitigating the worst impacts. In some ways, the climate crisis seems hopeless. What is required is massive, wholesale societal change, yet what has been most frequently proposed up to this point is tiny individual changes, such as eating less meat. There is justified concern that larger changes to consumption, commodity pricing, and distribution models would be anathema to the citizenry, and thus unobtainable. But as I think about programs implemented in the past few decades, I think there is reason to be hopeful and optimistic about some of the changes required. In the mid 1980s, California introduced a 5¢ fee on beverage containers, which could be recovered through recycling. Over time, an entire infrastructure sprung up around this market-based recycling approach. I fondly recall smashing soda cans in the garage as a kid, and then bringing a big bag of them to a recycling center near our supermarket in exchange for a voucher we could redeem for groceries. Recently this program has struggled as the result of a global shift in how recycling is processed, but even still 80% of beverage containers in California end up being recycled. For the most part, Californians took in stride the sudden absence of some 13 billion bags that in previous years were handed out at grocery checkout counters and by other retailers of all sorts. Maybe a few grumbled at first about the inconvenience. But most adjusted quickly, perhaps because they intuited that something was not right about all those plastic bags hanging from trees, caught up in storm drains, clumped by the sides of freeways and floating in the ocean. How do plastic bags and soda cans relate to the Green New Deal? Changes to our food distribution system will be critical to achieving the necessary carbon reduction targets. Taxes, caps, subsidies, or whatever other approach is chosen, at the end of the day, certain types of foods and transportation will become more expensive, and certain types of packaging will need to change. Think about everything that comes from a grocery store, and just how much single-use packaging is involved. Every single-serving yogurt, granola bar, bag of chips, tub of hummus, frozen dinner, and clamshell case of strawberries is made up of single-use packaging that is devilishly difficult to recycle, if we even try. On the other hand, glass, aluminum, cardboard? Pretty easy (assuming the packages are clean). The future I envision is more like Sprouts or Whole Foods than Ralphs and Safeway. More prepared foods made in-store, distributed in reusable plastic or aluminum trays that come with a redemption value attached. More large bins of bulk items — coffee, nuts, grains, snacks — that are distributed in reusable bags and tubs that we simple get used to bringing with us every time we shop. A lot of the innovations in packaging in the last few decades have been around making products last longer in transport and on shelves. We have made the tradeoff of reducing food waste in exchange for distributing food in increasingly complex packaging that is impossible to recycle. This is an energy-intensive and petroleum-heavy endeavor, and I think the trend will need to shift the other way. We will be faced with some level of reduced choice as the cost of carbon-heavy packaging and long-distance transportation rises, driving up the prices of foods that are distributed that way. Some of the biggest names in food production and distribution will not be able to adapt, and will go out of business. But we will shift towards more local production, more buying in bulk, and more local preparation. It is not just transportation and packaging that needs a drastic change, it is also how we choose to subsidize food production. Right now we dramatically subsidize the cost of meat, dairy, snacks, and sugary beverages through our subsidies of sugarcane, soybeans, and corn. On the one hand this helps to prevent food shortages and ensures that high-caloric food is affordable. But more sustainable would be to shift in the opposite direction, towards foods that are inherently calorie-dense (and healthier) without many levels of processing and intermediate steps. Will this raise the price of meat, cheese, and snacks? Sure it will. But if we can have a corresponding drop in the price of grains, fruits, and vegetables that are local and in season, consumption habits will adapt. Before long, our new food system will be the new normal. The food system, including agriculture, packaging, and distribution is incredibly complex, and the shifts and changes will be far more consequential, difficult, and expensive than simply reducing plastic bag waste. But programs like the plastic bag ban, can recycling, and others like subsidies for solar panels and electric cars show that we do have the tools at the policy and economic level to address these problems in a systemic way. And they show that, done sensitively and carefully, such changes need not result in widespread suffering or anger. I am not optimistic about our changes against the forces of nature and the impacts of over 100 year of industrialization, but I do believe there is a path forward. The fact that we have started talking about solutions — FINALLY! — gives me a little big of hope. I’m currently in Denver, Colorado at an industry conference. I’m sitting through a terrible talk by ITR’s chief economist, an old white guy who is playing to a room of old white guys, and it is making me seethe. He is talking about business growth and making all sorts of jokes at the expense of states with low birth rates, nations with fewer national resources, and “millennials” – just for existing. He also made the requisite jokes about how people hate economists. And we certainly do, when economists ignore the human costs. A $15 minimum wage is an antidepressant. It is a sleep aid. A diet. A stress reliever. It is a contraceptive, preventing teenage pregnancy. It prevents premature death. It shields children from neglect. But why? Poverty can be unrelenting, shame-inducing and exhausting. When people live so close to the bone, a small setback can quickly spiral into a major trauma. Being a few days behind on the rent can trigger a hefty late fee, which can lead to an eviction and homelessness. An unpaid traffic ticket can lead to a suspended license, which can cause people to lose their only means of transportation to work. In the same way, modest wage increases have a profound impact on people’s well-being and happiness. A 2017 study co-authored by Lindsey Bullinger, an assistant professor in the School of Public Policy at Georgia Institute of Technology, found that raising the minimum wage by $1 would reduce child-neglect reports by almost 10 percent. Higher wages allow parents working in the low-wage labor market to keep the lights on and the refrigerator stocked; failing to do so can court neglect charges. “These studies show the positive externalities of increasing the minimum wage on serious outcomes, like reducing child abuse,” Bullinger said, issuing an eloquent barb at economists’ obsession with the “negative externalities” of minimum-wage hikes. Today I learned that the “banana equivalent dose” is a way of comparing the relative level of radiation exposure of different activities. For example, a dental x-ray is the equivalent of eating 50 bananas. A transatlantic flight is like eating 800 bananas. A lethal dose of radiation is equivalent to 35 million bananas. Which is funny, because it only takes consuming about 200 bananas to die of potassium poisoning. The video is enjoyable, and (spoiler) it also happens to be a performance of 4’33”, so you get a two-for-one. You’re welcome. Welcome back. When I started blogging in 2001, there was no Facebook, Instagram, or Twitter. Now there are all those things and more, and yet the vast social media empire seems more and more insidious and evil with every passing scandal. There is a place for personal media, privately owned, distinct and disconnected. So I’ve embarked on another upgrade and redesign of this venerable blog, featuring a fresh new look and the latest is WordPress hypermedia magic behind the scenes. For fun I whipped up a data visualization, and the change in posting habits over time is dramatic. Graph of posts over time. A live version of this graph now lives at the bottom of the homepage. First I took a job that heavily discouraged blogging, then I shifted more fully to Facebook and other social media platforms. I find myself using those platforms less and less, in line with the shifting habits of my friends and family. Yet I have thoughts! So many thoughts, just asking to be written down and broadcast to the indifferent world! So my goal for 2019 is to reverse this trend. I will post more here, and less those other places. With any luck this won’t be a repeat of 2014. Stays true to the spirit of the classic but charts its own course. Delightful music, dance, costumes, and animations. As good as the original, maybe better? I was worried about potential missteps, but there were none. I have heard nothing but good things about this movie and couldn’t wait to finally see it. It lived up to all expectations. The animation, the story telling, the humor, the emotions — brilliantly constructed. This is the first superhero movie I’ve seen in ages that felt fresh and new. Even in places where it was formulaic there were new twists and interpretations. As soon as it was over I wanted to go back and see it again. A Christmas day surprise present. Here’s to new beginnings and exciting adventures to come.